However the Supreme Court rules, Obamacare isn't enough. We need a more fundamentally egalitarian health care system. 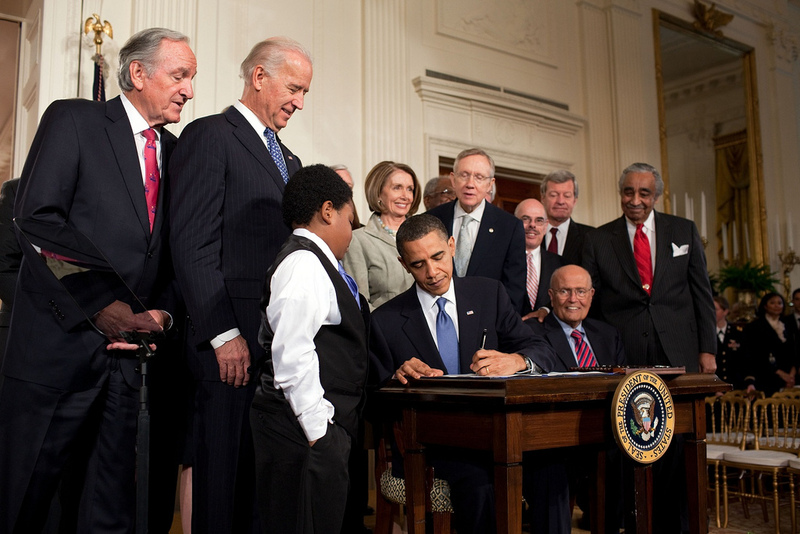 President Obama signs the health care law in 2010. Georgia Health News. Alas, as Rosen and others have noted, they also violently undercut the inadequate but at least functional system of church-based charitable care — before their own sweeping projects ever came close to fruition. Good intentions were insufficient, and it was the poor and ill who suffered the consequences. With both Bastille Day and a decision in King v. Burwell — the case now before the Supreme Court that may threaten the viability of the Affordable Care Act (ACA) — soon to be upon us, this episode seems reasonably relevant. The Affordable Care Act isn’t — and is never going to be — adequate for delivering health care justice. At the same time, the sudden withdrawal of private health insurance from millions of Americans would be a human travesty that no sensible left should countenance, much less celebrate. Yet such an acknowledgement must not mean turning a blind eye to the deep structural inadequacies of our health care system, which will persevere — whatever the decision of the Supreme Court — until more fundamental change is won. There are many roads to what is called, often problematically, “universal health care.” Some nations — for instance, Canada — have systems of national health insurance in which a governmental “payer” insures everyone (though the provision of care may remain predominantly private). Other nations have “national health services” — e.g., Britain — where the provision of care is a direct public service. The health care reforms embodied in the ACA are neither of these: the law instead contains a number of intricate, interlocking provisions designed to lower the number of uninsured while preserving the role of private insurers (and also accommodating, not infrequently, the for-profit provision of care). Understanding the complicated interdependency of the ACA’s insurance reforms is crucial to appreciating its fundamental vulnerability to legal challenges. This interdependency is frequently conceived as a precarious “three-legged stool”: a well-aimed kick delivered to any single leg, it is argued, would topple the law in its entirety. The first “leg” is the ACA’s provision preventing insurance companies from discriminating against those with “pre-existing” conditions (for instance, through the imposition of punishingly high premiums). This particularly popular provision most easily accords with a sense of common decency. The second leg of the stool is the “individual mandate,” a concept with its genesis, as is frequently noted, in the conservative Heritage Foundation. The mandate requires that the uninsured buy private health insurance or pay a penalty, so as to prevent “free riders” from taking advantage of the protections afforded by the first leg (for example, by postponing the purchase of insurance until one is in the throes of a terrible illness). In 2012, this leg came close to being severed in the Supreme Court case National Federation of Independent Business v. Sebelius, but emerged with its constitutionality intact by a single vote. And third, given that it would be rather cruel to mandate the purchase of health insurance for people who cannot physically afford it, the law provides income-adjusted subsidies for those who buy plans on the ACA’s “exchanges.” It is this leg that is now under threat in King v. Burwell. The presentation, Kliff writes, pointed out one eyebrow-raising finding: a single provision of the ACA referred to subsidies being available to those who purchased insurance in exchanges “established by the state.” However, most states — thirty-four at present — have elected not to set up their own exchanges, and to instead rely on the federal government’s exchange (which the law permits). If the Court finds that residents of those thirty-four states are not eligible for federal subsidies, it could deliver a potentially fatal blow to Obamacare: those who purchased plans in these states would quickly lose the subsidies that made buying health insurance affordable. The purpose of the statute is clear, however, and there is no evidence, other than the four words on which these cases turn, that Congress meant to deny millions of Americans health insurance simply because their states elected not to operate exchanges. Though that may be true, the health care access of these millions now very much hinges on the Supreme Court’s interpretation of the clause. As things stand, individuals and families earning up to 400% of the federal poverty level are eligible for premium subsidies; in the thirty-four states using the federal exchange, about 6.4 million people (or 87% of those buying insurance on the exchange) would be at risk of losing these subsidies. According to the Kaiser Family Foundation, the loss of these subsidies would translate into an average premium increase for these individuals and families of 287% (ranging from a 132% increase in Arizona to a whopping 650% increase in Mississippi). Furthermore, those who were sick would try harder and sacrifice more to stay in the exchanges than those who were well, which would further destabilize the actuarial basis for the marketplace. According to modeling by the RAND Corporation, this would result in an overall decline in enrollment in the individual market by 9.6 million. And Congress isn’t likely to deliver to Obama the simple “one sentence” fix needed to resolve this snafu, while a variety of substantial political and legal barriers would preclude or at least hinder an effective, expeditious remedy at the state level. Though there may be some debate about the precise effects of uninsurance on mortality, the consequences of such an abrupt change should not be underestimated. Simply put, pulling the rug — or the hospital bed — out from under millions of people cannot be accomplished without substantial bloodshed. By one estimate, some 9,800 “additional deaths” a year may result from such a surge in the ranks of the uninsured. And yet, a careful look at the very health insurance plans now under threat in King v. Burwell (the “non-group” plans purchased through the ACA exchanges) demonstrates why the heath care reform law, and the US health care system as a whole, will remain grossly unjust regardless of the Supreme Court’s ruling. First, the combination of the individual mandate, the expansion of Medicaid, and the subsidy-supported health insurance plans (assuming a positive outcome in King) will still leave some 27 million people in America uninsured. Second, the exchange plans themselves reflect a type of health insurance entirely at odds with a more expansively defined “universal health care,” in which health care access is not only universal, but also equitable, and where covered services are free at the point of care. Many of those who receive subsidies to purchase plans on the exchanges, for instance, still have serious financial exposure to medical bills. Average deductibles — i.e. money paid out of pocket before insurance kicks in — for the standard “silver” family plans in 2015 are estimated to be $6,010. Out-of-pocket costs for copayments and deductibles — after premium payments — can be as high as $13,200 for a family making as little as 250% of the federal poverty level (or $60,625 for a family of four). Such out-of-pocket health care costs satisfy the dogmatists of “consumer-driven medicine” while further squeezing the working class. Given such limitations, is it inconsistent to denounce an outcome in King that strips many of health care access? Certainly not: our friends, family members, partners, and patients currently rely on such plans. This is the awkward position that the Left always straddles when flawed social welfare programs come under attack. The meaning of equality has changed. Today, as the French historian Pierre Rosanvallon put it in his recent book The Society of Equals , equality is used as “a sort of negative incantation — ‘reduce inequalities’ — without a corresponding positive image of a better world.” This is even more true in health care. Moving forward must mean going beyond a discussion of increasing “health care access,” and working towards a vision of health care equality founded upon a single-payer national health program. However the Supreme Court rules, Obamacare isn’t enough. We need a more fundamentally egalitarian health care system.